The undefeated IBO/WBA/WBC/IBF middleweight title holder Gennady “GGG” Golovkin made his twentieth consecutive middleweight title defense, which tied him with the future Hall-of-Famer, Bernard Hopkins, with a devastating second-round knockout victory over two-time world title challenger, Vanes “The Nightmare” Martirosyan. This bout was televised on HBO from the StubHub Center in Carson, California. The longest-reigning current world champion (which started against Nilson Julio Tapia on December 16, 2010, via a third-round knockout) improved to 38-0-1, 34 KOs with the win. This was his first knockout victory after two consecutive bouts (against Daniel Jacobs and Canelo Alvarez) that went the distance. Before the Jacobs bout, he had knocked out twenty-three consecutive opponents. His IBF belt was not on the line for this fight. 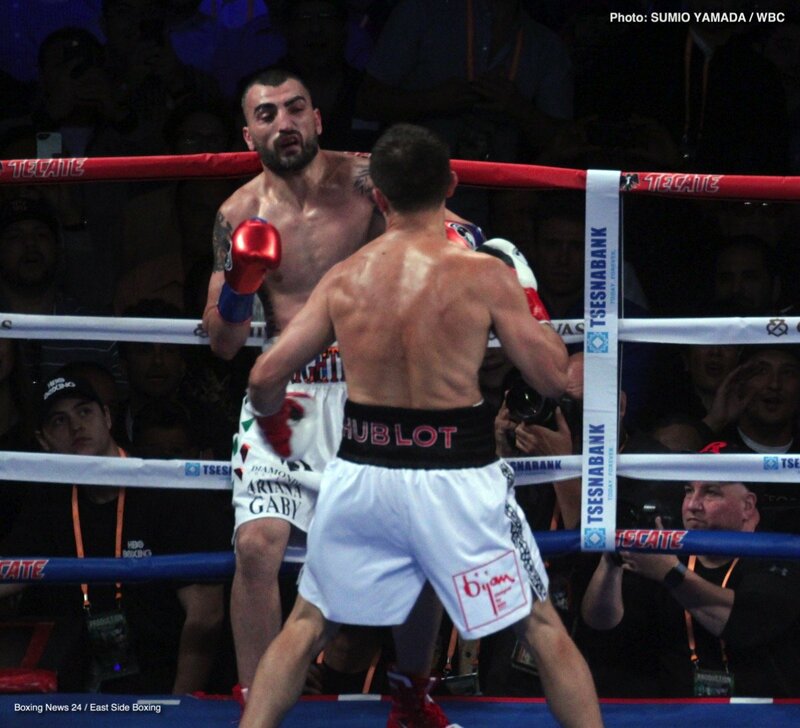 WBC’s number one contender, Vanes Martirosyan dropped to 36-4-1, 21 KOs. He has lost two in a row. This was the first time that he had been knocked out in his thirteen-year pro career. GGG and Martirosyan had a good, competitive back-and-forth first-round in which both fighters connected on several hard punches. Golovkin landed good headshots, while Martirosyan connected well to the body and landed a hard three-punch combination. GGG staggered Martirosyan at the end of the round with a powerful right, left hook. Both fighters continued to slug it out in the second as they connected on several big shots. Golovkin landed a hard right uppercut that snapped Martirosyan’s neck back. He then connected on a massive right hook followed by eight more powerful, flush punches that dropped Martirosyan face-first to the canvas. He was unable to beat the ten-count and referee, Jack Reiss stopped the bout at 1 minute and 53 seconds. According to CompuBox punch statistics, Golovkin landed more punches than Martirosyan (36 to 18), threw more (84 versus 73), and had a better connect percentage (43 to 25). GGG also connected on a little more than half of his power shots (16 of 30), 11 of those punches came towards the end of the second-round for a 73 connect percentage. Martirosyan landed 10 of 31 power shots. He connected on more power shots (6 to 5) than GGG in the first-round. Martirosyan deserved a great deal of respect for fighting GGG when many other boxers did not want to. Moreover, he came to fight and try to mix it up with Golovkin for the entire bout. He only had three weeks to prepare for this fight, yet fought a good first-round, held his own in the second until GGG’s power took over, and there are very few fighters in the world that could have gotten up from that knockdown. While it was great to see Golovkin score a devastating highlight reel knockout, this was not the ideal matchup that boxing fans wanted to see. Instead they wanted to watch the highly anticipated rematch of GGG vs. the two-division title holder and current lineal and Ring Magazine champion, Saul “Canelo” Alvarez. Both fighters fought a highly controversial twelve-round draw in September that most fight fans and observers believed that Golovkin had done more than enough to prevail. However, Canelo ruined that rematch by testing positive for Clenbuterol twice (February 17th and February 20th) which he blamed on eating contaminated meat while training in Mexico. Canelo was given a six-month suspension by the Nevada Athletic Commission on April 18th, so he will be ready to fight again in September. Granted, Martirosyan was not the best replacement that Golovkin could have fought (he moved up a weight class, had not fought in over two-years, and was 3-3 in his last six-bouts coming in), yet it is not his fault that several other boxers did not want this fight. Spike Sullivan begged for his bout and then when it was offered to him, he refused, as did former WBA middleweight champion, Daniel Jacobs, and current undefeated WBO champion, Billy Joe Saunders. Golovkin should have boxed his unbeaten IBF mandatory, Sergiy Derevyanchenko, or to a lesser extent, undefeated Demetrius Andrade, but given how little time his camp had to find an opponent and with fighters backing out at the last moment and or not being approved by the Nevada Athletic Commission, it is difficult to obtain the perfect opponent. It will be interesting to see who GGG will face next and lucky for him, he has no shortage of quality opponents to face. He could fight a rematch against Canelo, which is by far the most financially rewarding bout for him since he could make at least twenty million dollars. Although leading up to his fight with Martirosyan, he indicated that he was no longer interested in fighting Canelo, this is by far his most likely next opponent. If the Canelo bout does not happen, then he could box against Derevyanchenko, in order to prevent his IBF belt from potentially being stripped, or he could fight Saunders to become the unified middleweight champion, something that he has wanted to do for a long time, or maybe, he could challenge top-rated undefeated, Jermall Charlo or Ryota Murata.